The original print and web versions of this report contained an error in Table 6.B1. Data shown for columns "One-half or more of entitlement months" and "Less than one-half of entitlement months" were incorrectly transposed. Corrected data now appear in the web versions of this report. The original print and web versions of this report contained an error in Table 3.E3. Footnote e, reading "Less than 0.05 percent," was incorrect. The corrected footnote, "Less than 0.5 percent," now appears in the web versions of this report. The original print and web versions of this report contained errors in the Health Care—Medicare section of Highlights and Trends. For "Number of enrollees in July 2008 (one or both of Parts A and B)," the values given for all, aged, and disabled enrollees were incorrect. The correct values of 45.4 million, 37.9 million, and 7.5 million, respectively, now appear in the web versions of this report. The original print and web versions of this report contained errors in Table 5.F9. The number, cumulative percentage, and average monthly benefit values in the 1970 row were incorrect. The correct values are 2,188, 99.9, and 787.50, respectively. These errors have been corrected in the web versions of this report. The Supplement is a major resource for data on our nation's social insurance and welfare programs. 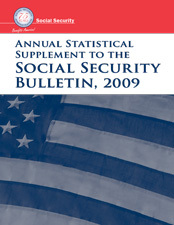 The majority of the statistical tables present information about programs administered by the Social Security Administration—the Old-Age, Survivors, and Disability Insurance program, known collectively as Social Security, and the Supplemental Security Income program. In addition, data are presented on the major health care programs—Medicare and Medicaid—and social insurance programs, including workers' compensation, unemployment insurance, temporary disability insurance, Black Lung benefits, and veterans' benefits. The Supplement also includes program summaries and legislative histories that help users of the data understand these programs. Please note that additional disability tables and statistics can be found in the SSI Annual Statistical Report and the Annual Statistical Report on the Social Security Disability Insurance Program. The Supplement has been published annually since 1940. Decisions affecting the future of Social Security are facilitated by the availability of relevant data over a long period. The data provide a base for research, policy analysis, and proposals for changing the programs. In addition to meeting the Social Security Administration's information needs, the Supplement strengthens the agency's ability to respond to requests for program data from congressional committees, government agencies at all levels, and the research community. The Supplement is prepared by Social Security Administration staff from various components throughout the agency and by many individuals from other federal agencies. I would like to express my thanks to them for their contributions.